Objective: In this study, a meta-analysis was performed to investigate whether there is an association between glutathione S-transferase (GST) gene polymorphism and chemosensitivity in patients with osteosarcoma. Methods: A comprehensive electronic database search was performed between January 1, 2016, and May 21, 2016. All eligible studies related to GST gene polymorphism and chemosensitivity in patients with osteosarcoma were screened and included in the current meta-analysis. The association between GSTT1, GSTM1 and osteosarcoma chemosensitivity was demonstrated by odds ratio (OR) and corresponding 95% confidence interval (CI). 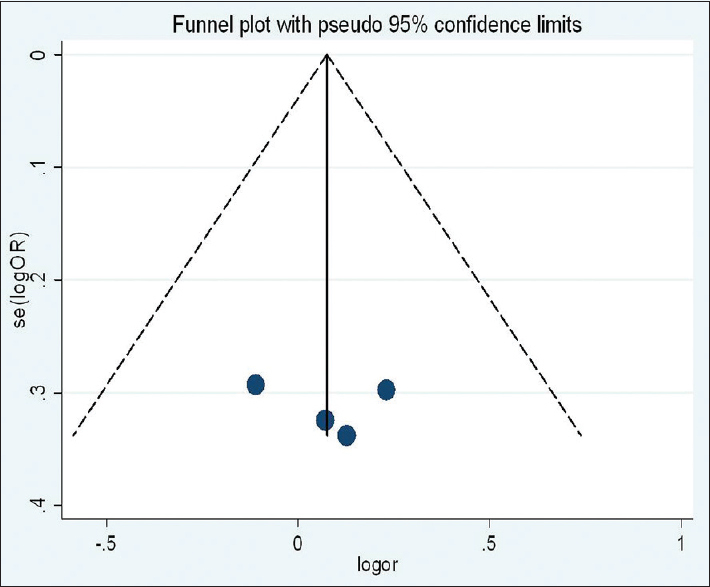 The publication bias was assessed by Begg's funnel plot. Results: A total of four studies with 681 osteosarcoma patients were included in the present study. The data were pooled by fixed effect model for lack of statistical heterogeneity. The results showed there was no significant association between GSTT1 OR = 1.04, 95% CI: 0.77–1.41, P > 0.05), GSTM1 (OR = 1.08, 95% CI: 0.80–1.46, P > 0.05) gene polymorphism and chemosensitivity in patients with osteosarcoma was found by pooled the published data. 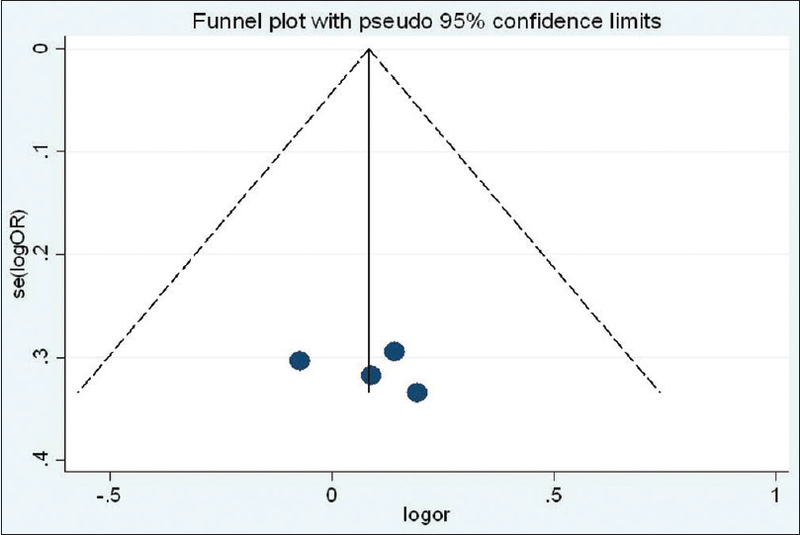 Begg's funnel plot indicated no significant publication bias in meta-analysis. Conclusion: Glutathione S-transferase gene polymorphism had no association with chemosensitivity in patients with osteosarcoma. Glutathione S-transferases (GSTs) are a family of cytosolic enzymes involved in the detoxification of various exogenous, as well as endogenous reactive species., The coding region of GSTT1 and GSTM1 polymorphisms was considered to confer different catalytic activities. The effects of these polymorphisms on drug metabolism, including chemotherapeutic agents, make these genes candidates for investigation of toxicity and resistance to chemotherapy regimen. Several case–control studies have evaluated the association between GST gene polymorphism and osteosarcoma chemoresistance. However, for small cases number involved in each study, the statistical power is limited with inconclusive results. Two reviewers (Lan Jun, Yang Qi,) independently searched Medline, Embase, China National Knowledge Infrastructure (CNKI), VIP Chinese science and technology periodical database (VIP) and Wanfang databases. The searching terms were “glutathione S-transferase”, “GSTs”, “GSTT1”, “GSTM1”, “polymorphism,” and “osteosarcoma.” The reference of the included studies was also a reviewer for other potential available studies. The inclusion criteria were: (1) open published studies associated with GST gene polymorphism and chemosensitivity in patients with osteosarcoma. (2) Osteosarcoma diagnosis was confirmed by pathology or cytology, (3) the cases included in each individual study was Chinese patients, (4) the patients in the included studies do not received radiation therapy, and (5) the genotype distributions of control cohorts should be accord with Hardy–Weinberg equilibrium. Two reviewers (Zhou Mingping and Xu Rongcheng) independently extracted the data according to the inclusion and exclusion criteria. The disagreement was consulted to a third reviewer (Zhou Chongbin) to get conclusion. We collected the following information in the articles: Name of the first and corresponding author's, article publication year, country, number of case/control, genotype distributions of case and control, and method of genotyping. The Stata was analyzed by the Stata11.0 (http://www.stata.com; Stata Corporation, College Station, TX) and Revman 5.0 (http://ims.cochrane.org/revman/download) software. The odds of null and present genotype in chemosensitivity and chemoresistance patients were demonstrated by the odds ratio (OR) and correspondence 95% confidence intervals (CI). Chi-square test  was used to evaluate the statistical heterogeneity across the included studies. The OR was pooled by fixed or random effects model according to the statistical heterogeneity. The Begg's funnel plot was used to assess the publication bias. By searching the databases, a total of four publications were finally included in the current study. All the four included studies were published in English. One study using polymerase chain reaction (PCR) restriction fragment length polymorphism as the genotyping method and other three studies use the PCR as the genotyping method. The characteristics of all studies are illustrated in [Table 1]. The statistical heterogeneity among the included four studies was evaluated by Chi-square test. No significant heterogeneity among the studies was found in GSTT1 and GSTM1 gene (P > 0.05). Chi-square test demonstrated no significant heterogeneity in evaluation GSTT1 polymorphism and osteosarcoma (P > 0.05). The data were combined by fixed effect model. The pooled results showed the chemosensitivity was not statistical different for polymorphisms in null and nonnull GSTT1 with the OR = 1.04, 95% CI: 0.77–1.41 (P > 0.05), [Figure 1]. The data were pooled by fixed effects model because of no significant heterogeneity was existed in this study. No significant association between GSTM1 polymorphism (null vs. present) and chemosensitivity in patients with osteosarcoma was found by fixed effect model (OR = 1.08, 95% CI: 0.80–1.46) [Figure 2]. No significant publication bias was found in GSTT1 [Figure 3] and GSTM1 [Figure 4] genetic polymorphism and chemosensitivity in patients with osteosarcoma according to Begg's funnel plot. Osteosarcoma, also called “osteogenic sarcoma,” is a life-threatening malignancy prevalent in adolescents and children., Its exact etiology or pathogenesis remains unclear. However, studies have confirmed that its incidence is correlated with genetic factors. The conventional treatment for osteosarcoma includes neoadjuvant chemotherapy and postoperative adjuvant chemotherapy. However, about half of patients with osteosarcoma have conventional chemotherapy tolerance because of the multidrug resistance of human osteosarcoma cells. As successively reported in recent years, a certain relationship exists between the polymorphism of GST and osteosarcoma chemosensitivity. GST, a detoxification enzyme family that alleviates oxidative stress, can expel such toxicants from the body by increasing water solubility. To date, eight types of different GSTs, namely GSTα, GSTκ, GSTδ, GSTω, GSTμ, GSTπ, GSTξ, and GSTθ have been found in humans and mammals. The current studies on osteosarcoma are mostly concerned about GSTM1 and GSTT1, which belong to the GSTμ family. They affect the absorption and metabolism of chemotherapy drugs in the body and act on the drug resistance mechanisms of tumors. In the present study, meta-analysis is used to explore the polymorphisms of GSTM1 and GSTT1 and their relations with the osteosarcoma chemosensitivity of the Chinese Han population. Four case–control studies are examined, and the results show that the polymorphism of GSTM1 or GSTT1 is unconcerned with the osteosarcoma chemosensitivity of the Chinese population. However, the efficacy of sarcoma chemotherapy is related to a variety of related genes. The gene–gene and gene–environment interactions may have more obvious effects on the efficacy of chemotherapy. Thus, they can sufficiently explain any inherent correlation in the single analysis on the relationship between the polymorphism of a gene and chemosensitivity. Different trials may have different chemotherapy regimens and chemotherapy drug manufacturers, and thus the efficacy of chemotherapy may be affected. These different trials are also another cause of irrelevance. This study adopts four qualified references with a small sampling size and low statistical performance. These conditions may likely be the main causes of the polymorphism of GSTM1/GSTT1 with the osteosarcoma chemosensitivity of the Chinese population. Ketterer B. Protective role of glutathione and glutathione transferases in mutagenesis and carcinogenesis. Mutat Res 1988;202:343-61. Hengstler JG, Arand M, Herrero ME, Oesch F. Polymorphisms of N-acetyltransferases, glutathione S-transferases, microsomal epoxide hydrolase and sulfotransferases: Influence on cancer susceptibility. Recent Results Cancer Res 1998;154:47-85. Yang LM, Li XH, Bao CF. Glutathione S-transferase P1 and DNA polymorphisms influence response to chemotherapy and prognosis of bone tumors. Asian Pac J Cancer Prev 2012;13:5883-6. Wang X, Zuckerman B, Pearson C, Kaufman G, Chen C, Wang G, et al. Maternal cigarette smoking, metabolic gene polymorphism, and infant birth weight. JAMA 2002;287:195-202. Teng JW, Yang ZM, Li J, Xu B. Predictive role of glutathione S-transferases (GSTs) on the prognosis of osteosarcoma patients treated with chemotherapy. Pak J Med Sci 2013;29:1182-6. Liu S, Yi Z, Ling M, Shi J, Qiu Y, Yang S. Predictive potential of ABCB1, ABCC3, and GSTP1 gene polymorphisms on osteosarcoma survival after chemotherapy. Tumour Biol 2014;35:9897-904. Li JZ, Tian ZQ, Jiang SN, Feng T. Effect of variation of ABCB1 and GSTP1 on osteosarcoma survival after chemotherapy. Genet Mol Res 2014;13:3186-92. Xu L, Pan Q, Lin R. Prevalence rate and influencing factors of preoperative anxiety and depression in gastric cancer patients in China: Preliminary study. J Int Med Res 2016;44:377-88. Sampo M, Koivikko M, Taskinen M, Kallio P, Kivioja A, Tarkkanen M, et al. Incidence, epidemiology and treatment results of osteosarcoma in Finland – A nationwide population-based study. Acta Oncol 2011;50:1206-14. Savage SA, Mirabello L. Using epidemiology and genomics to understand osteosarcoma etiology. Sarcoma 2011;2011:548151.